The Handi-shelf is perfect for storing rods of glass. 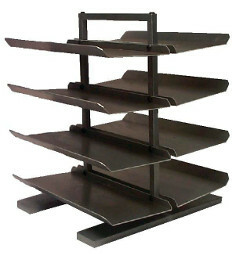 The four aluminium shelves are separated into eight sections. Each section is angled towards the center of the shelf to keep the glass from rolling. Each section also has lips on both the inside and the outside to ensure the safety of the glass. The top brace of the frame makes a perfect handle for easy transport. The multiple shelves make separating different types of glass a cinch and are spaced for ease of use. Approximate dimensions for the Handi-shelf are 12 inches by 12 inches by 14 inches high.